The discussion around valuation for these types of transactions usually centers on what multiple of EBITDA is appropriate. For guidance, parties often look to the valuation multiples of publicly traded companies and of large private transactions where the multiple is publicly disclosed. However, empirical data show that the size of the business helps determine what the appropriate multiple is with regard to valuation. The two primary factors that affect valuation multiples are risk and growth. Businesses that are perceived to be riskier sell for lower multiples, while businesses with higher potential for future growth sell for higher multiples. Larger healthcare organizations typically have advantages in both areas. Risk. Larger companies tend to be geographically and/or operationally diversified. Health care is local, and a shift in local competitive dynamics can have a major impact on smaller healthcare organizations. Larger companies diversify this risk. Growth potential. Most larger healthcare services companies have established platforms for growth. They have developed the systems and hired the talent to grow into new markets whether through acquisition, joint venture, or de novo. As a result, they are built for steady, sustained growth, unlike typical smaller organizations. 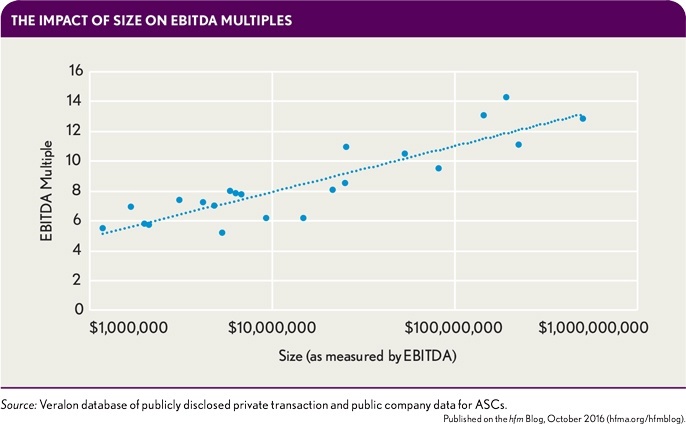 As an empirical example of the relationship between size and valuation, we compiled multiples specific to the ambulatory surgery center (ASC) industry. We were able to identify 17 transactions since 2010 with publicly disclosed price-to-EBITDA multiples and five involving publicly traded companies that own and operate ASCs, and plotted the corresponding valuation multiples by size, as measured by EBITDA. There is a clear correlation between the size of the company and the EBITDA multiple at which these ownership transactions occur. As a result, the public-market multiples for Surgical Care Affiliates or from the recent Tenet/USPI transaction, for example, cannot be appropriately applied to the purchase of a single ASC. 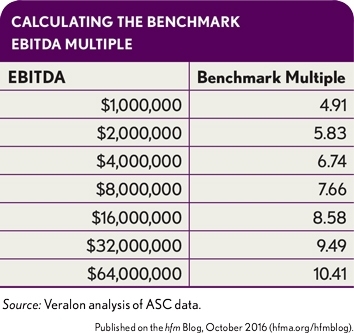 We also utilized the data in the exhibit above to develop a regression formula that can be used to calculate a benchmark multiple for ASC companies of different sizes. Output from this formula is presented in the exhibit below. Based on this formula, the valuation increases by a multiple of approximately 0.9 each time the EBITDA amount doubles, indicating that the size of the company has a significant impact on its perceived risk and potential for future growth. Although this data is specific to ASCs, the same concept applies to the vast majority of healthcare organizations. Valuations based on public companies and other “back of the envelope” calculations are unlikely to be reliable, given that healthcare valuation is such a complex and subtle science.